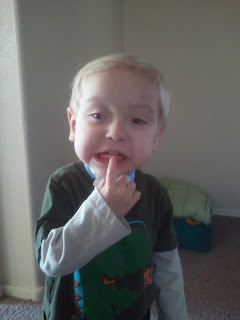 Teeth... Emmett is currently cutting 8 new teeth. Yes, Emmett is a bit old for teething, one of the side affects of not orally feeding. Emmett has not used his little mouth in over a year and a half to eat. He is strictly fed through a gastrostomy tube also known as a G-tube. It is so interesting to me to learn how our bodies are made to naturally develop and grow. Even the simplest thing as using our mouths to bite down on foods which softens up the gums for the teething process to begin. Remarkable how the body is made. Emmett is still not eating by mouth but is able to use teething and oral stimulation tools to help with his verbal development. 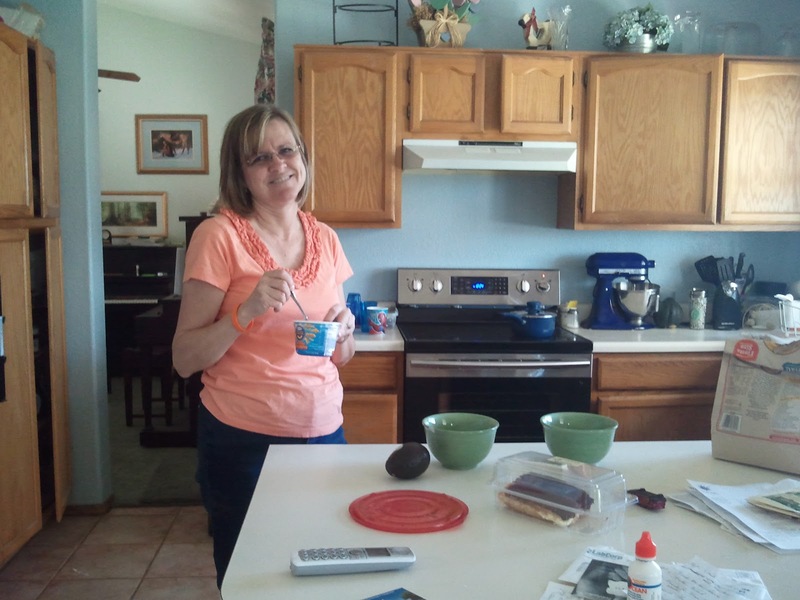 On Friday we ventured over to Grandma's house for lunch. 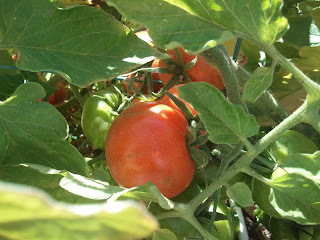 Grandma has a delicious vegetable garden. 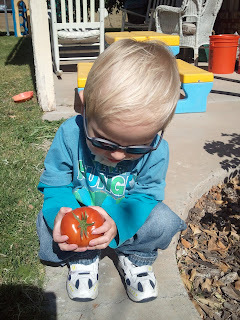 Emmett helped pick the perfectly ripe tomato's for our soup. 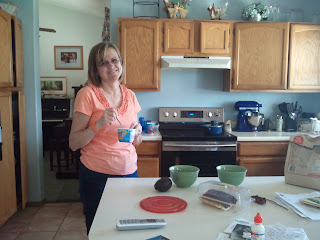 Grandma aka my mother, is preparing the dishes for lunch. Ethan however, has a difference in taste of food's and requested Mac n Cheese. 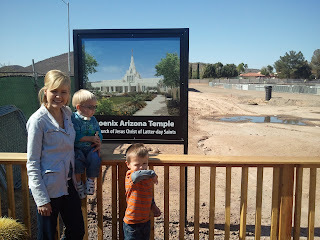 We then traveled about a mile or two down the road to visit the Phoenix Arizona Temple site. 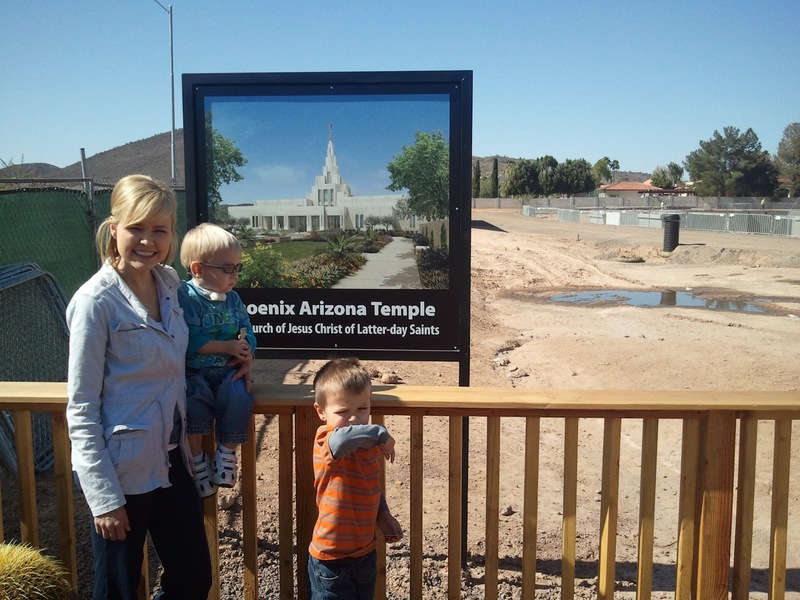 We are so excited for it's completion. Ethan and Emmett enjoyed watching the tractor's and cranes move about the landscape. I am so excited about this... Ethan, Emmett , Grandma and I went to explore the great outdoor's at a near by hiking trail. Emmett walked a majority of the way. His endurance is proving to be more and more. 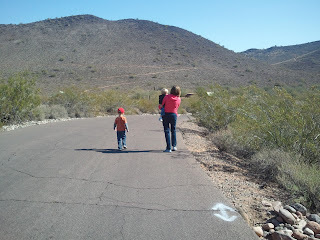 He loved running along the paved trail with Ethan and stopping to watch the ground hogs or birds ran across the road. All I can say is Life is Good!!! Go Emmett, Go! The hive's have finally left Emmett's body. The cause for the bout of 3 week hive's is still a mystery, however a dose of a 5 day steroid did the trick and Emmett has been hive-less for a week now. Emmett met a new physician, Dr Rose, he is an Allergist and Immunologist. Kind man, he spent a generous amount of time meeting and learning about Emmett. I think Dr Rose will be a great addition to Emmett's team for his road to recovery. I am so thankful every day that Emmett is home! We are going on 7 1/2 consecutive weeks. Each morning that I wake up and know that Emmett had a restful and safe sleep with the watchful care of his great nurses, bring's such peace to my mind. I am so thankful to my Father in Heaven for each moment we have together as a family. I love waking up to his sweet smile, or his excited face when he see's Ethan for the first time each new day. I soak in the picture of Ethan and Emmett playing together. 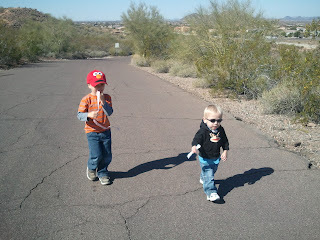 Emmett is Ethan's little shadow. Emmett is quite the two year old... For example... I just had to run into his room because he pulled off his pulse monitor, as I walked, in he had the oximeter in his hand. Stinker! I love it though... Emmett is being a two year old, whether he is in a sassy mood or not, I am so grateful for these moments. This image is of Emmett's pulse oximeter. The top number (red) shown is his oxygen rate that is being passed through his body. The bottom (green) number is his heart rate. For his age, literally these number's could not be any more perfect. I find my self taking a deep breath, relief! 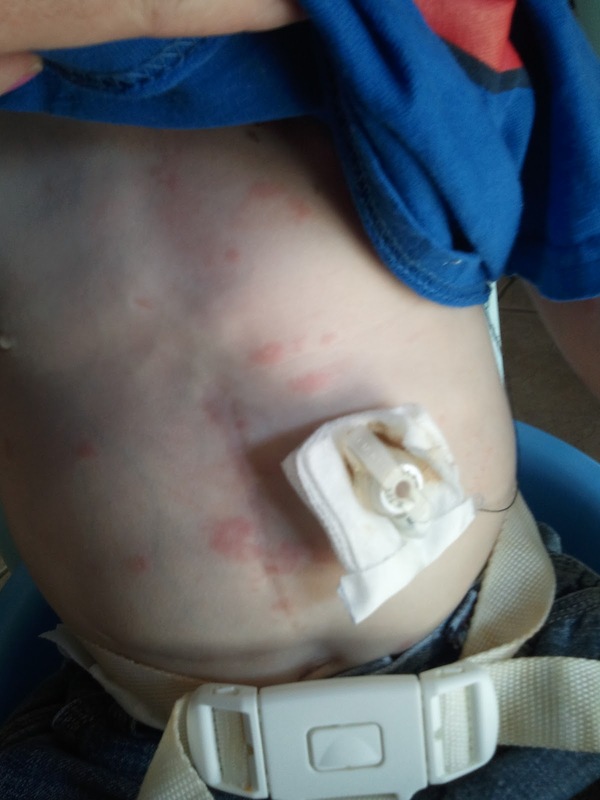 For over a year, Emmett's pulse oximeter would alarm continuously, informing us that either Emmett's body was not taking in enough oxygen or that his heart rate was dangerously high. The stress that it cause for both Michael and I was felt unbearable at times. How thankful we are, that we are no more seeing these dangerous number's. I praise God for these past 7 weeks. Emmett is home and Michael and I are now able to set goals and plan family picinic's at the park and enjoy being a family home once again. We are so blessed! Once again we ask for all to continue to spread the word and share Emmett's survival story. 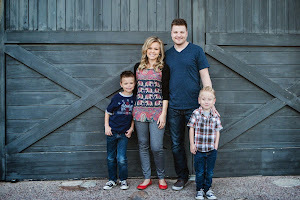 It can be as simple as email Emmett's website www.emmettsfight.com to family and friends. Thank you for all that you do in spreading awareness about Button Battery Ingestion! The Hive's have returned. Actually they only disappear for about 24hours after the last break out a few weeks ago. He have been in to see the Pediatrician and will return again for another evaluation tomorrow. 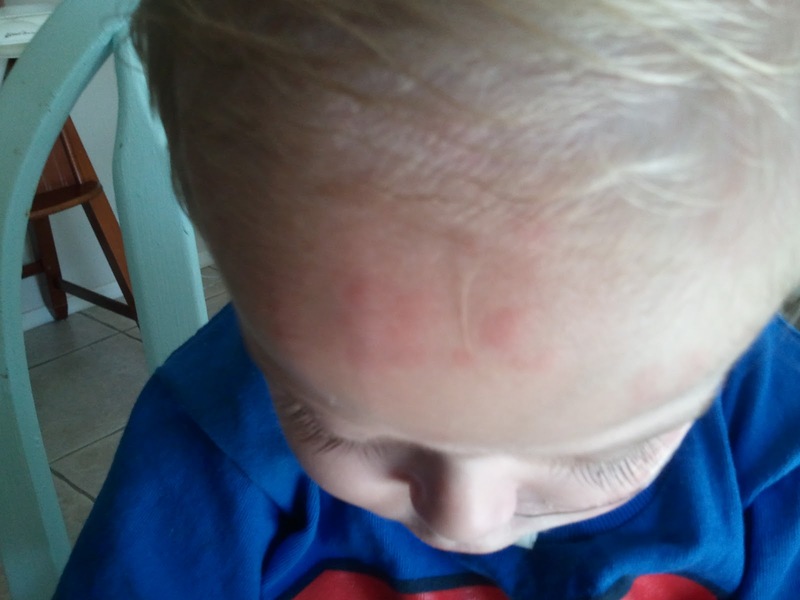 Also we have been speaking with his Specialist and we believe the cause is one of the many medications maybe causing this allergic reaction. Thankfully Emmett is not in any distress respiratory wise. Problem is... he has had no new changes to his medications in 6 months. Crazy! Finger painting... This activity is difficult for me. I get a little anxiety thinking about paint possibly being splattered around my kitchen by very curious and creative 2 and 4 year old. However I took a deep breath and caved in. Thank goodness for washable paint. Emmett liked using his pants to wipe the paint off of his adorable little fingers. 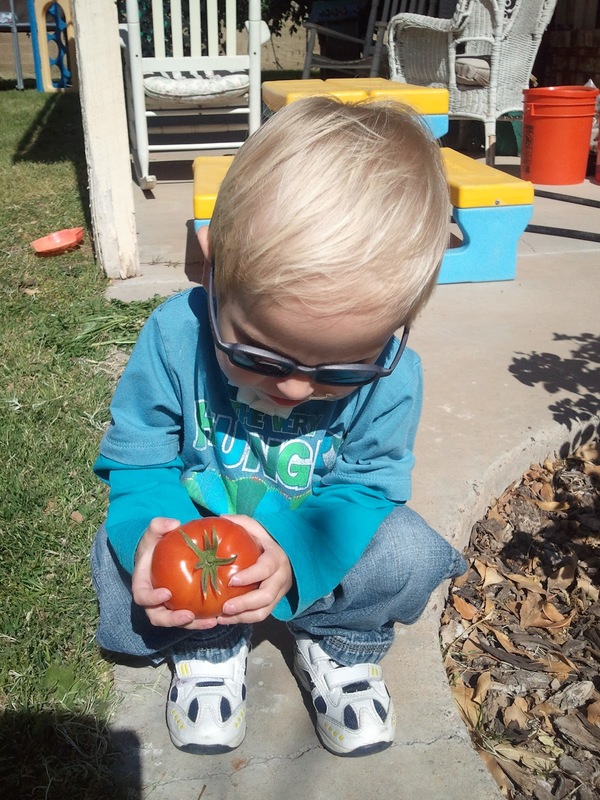 Emmett is continuing to thrive! 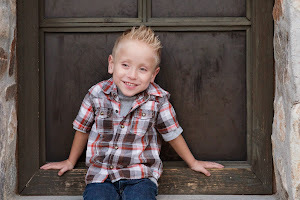 For so long we have been struggling to keep Emmett stable medically speaking. Now that Emmett has a secure airway (Trach), he is able to do things that he has never done before, be a true 2 year old boy. Emmett's terrific Therapist's are proactively setting goals for his rehabilitation, now that he is stable. It is going to be a whole lot of work, however I am so excited to be at this stage of Emmett's life! We are so blessed, thank you dear God! I will keep updating Emmett's progress as we keep moving forward!